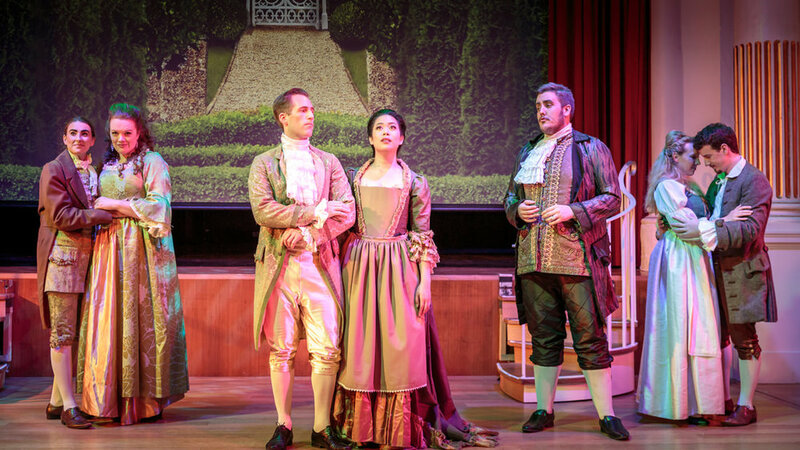 Madness, mischief and mistaken identity are at the heart Mozart’s La Finta Giardiniera. Before the opera even starts, the Countess Violante Onesti is stabbed and abandoned by her lover, Count Belfiore, in a fit of jealousy. Belfiore flees, believing her to be dead, but she recovers and goes into hiding at the home of the Mayor of Lagonera. Disguising herself as a servant girl or ‘la finta giardiniera’ in the Podesta’s gardens, she calls herself Sandrina and instantly becomes the object of the Podesta’s unwanted affections. Meanwhile, Sandrina’s servant Nardo has his eyes set on Serpetta, the Podesta’s real servant, who is determined to become the mistress of the house. The drama intensifies as Arminda, the Podesta’s niece, arrives for her wedding to an unknown nobleman, for whom she has cruelly abandoned her former lover, Don Ramiro. And when Arminda’s new fiancé is revealed… well, let the couple swapping begin.